TA Truck Service offers the most comprehensive heavy truck maintenance and repair facilities on the interstate, from coast to coast. With 1,090 bays at 244 locations across the country, our more than 3,000 technicians with certifications in ASE and TIA, offer complete preventive maintenance services, DOT inspections, a wide assortment of standard services, advanced diagnostics, alignments, refrigerated trailer maintenance, DPF cleaning at select locations and tire sales and repairs through the TA Truck Service Commercial Tire Network. The TA Truck Service Commercial Tire Network simplifies tire purchasing. Choose from leading tire brands including Goodyear, Goodyear Marathon, Kelly Tires, Yokohama, Continental, Roadmaster by Cooper, Pirelli, Formula and BF Goodrich, or participate in National Tire Account programs with Bridgestone or Michelin. Then, have your tires delivered to you, or have them installed at a TA Truck Service location, on the road by our RoadSquad roadside repair team or on your lot with our OnSITE mobile maintenance services. With RoadSquad and OnSITE services, we bring our expert truck service to you. 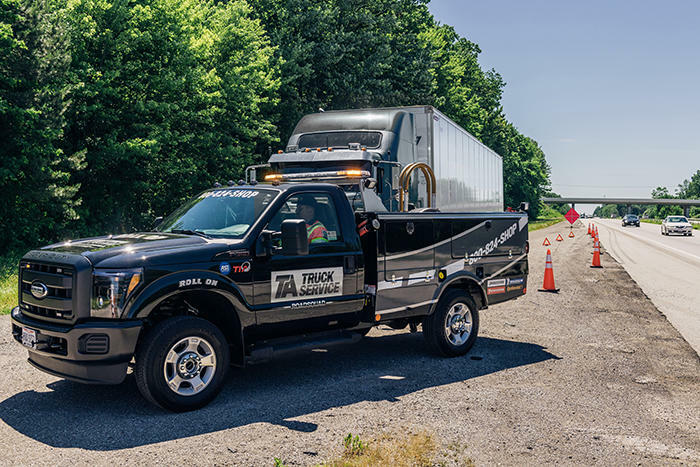 Our RoadSquad roadside assistance network includes 2,214 trucks dedicated to providing friendly service with a fast roll time that gets you back on the road quickly and safely 24 hours a day, seven days a week, 365 days a year. You can even experience the TA Truck Service difference right on your own lot or distribution center. Our 110 OnSITE mobile maintenance trucks provide maintenance on your schedule. While tractors or trailers are staged at your yard or distribution center, our “bays on wheels” can provide pre-trip inspections, DOT inspections, tire repairs and replacements, marker light operations checks, brake inspections and complete lubrication services so they will be road ready for your next load. From constantly sourcing and implementing the most innovative technology in the industry at our sites, to ongoing immersive technician training, you can trust TA Truck Service to deliver the best diesel maintenance and repair service in the industry.